Preheat the oven to 350 degrees F. Spray three 9-inch cake pans with cooking spray, line the bottoms with parchment, and spray the parchment. Place the raisins in a vegetable steamer over shallow water in a saucepan and steam for 10 minutes. Uncover and set aside. Grate the carrots using a food processor (I used the disc with largest holes, but you can grate them more finely if desired) or a standing metal grater. Measure and set aside. Sift together the flour, baking powder, baking soda, salt, cinnamon, and cocoa, and set aside. In the bowl of an electric mixer, beat the eggs. Add the vanilla, both sugars, and oil, and mix until well combined. Add the dry ingredients and mix on low speed only until combined. Stir in the carrots, raisins, and nuts. Divide the batter evenly among the three pans and use a spatula to even out the batter. Bake the pans for 35 to 40 minutes or until the tops just spring back when gently pressed with a fingertip and the cakes begin to pull away from the sides of the pan. Remove from the oven and let stand 2-3 minutes in the pans on a cooling rack. Run a small knife around the perimeter of the cake and invert the cakes onto a cooling rack and allow to cool completely. It is not necessary to remove the parchment from the bottoms of the cakes at this time. Brush any stray crumbs from the sides of the cakes and transfer the cakes to the freezer, unwrapped, for at least an hour, or until cakes are firm enough to handle. If you wish to freeze the cakes longer, wrap the frozen layers in plastic wrap and return to the freezer until you are ready to frost the cake. Do not thaw the layers before icing. When ready to ice the cake, prepare a large, flat cake plate by lining it with four strips of wax paper to make a square. This wax paper will catch any crumbs and icing while frosting the cake. Remove the parchment paper from the bottoms of the cakes. Place one cold and firm cake layer upside down on the plate. 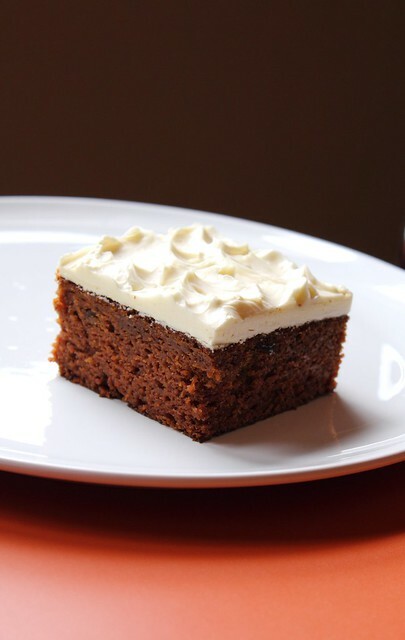 Spread a thin layer (2/3 cup) of the icing evenly over the cake. Cover with the second layer, also upside down. Spread another 2/3 cup icing over the second layer. Place the third layer on top, also upside down and spread the remaining icing over the top and sides of the cake. Remove the wax paper strips carefully. Garnish the cake with pecan halves. Refrigerate the cake for a few hours or for a day or two. Serve cold right from the refrigerator. In the bowl of an electric mixer, beat the cheese and butter until soft and smooth. On low speed beat in the vanilla and sugar, and then on high speed beat for a few moments until smooth. 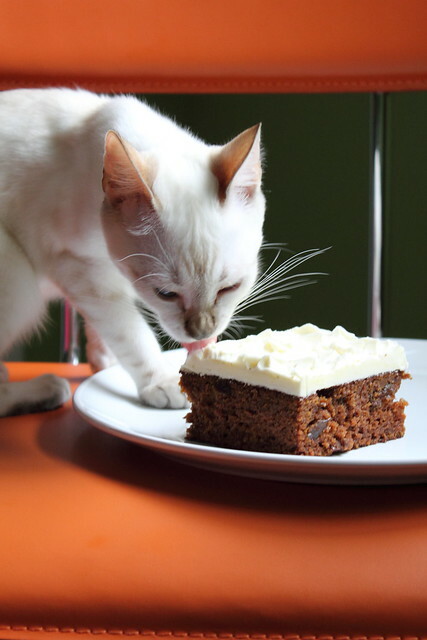 Gorgeous picture of your cat, and the cake looks amazing as well. I'll be trying this out for sure!